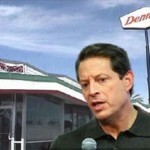 By Barry Hussein, HOUSTON – Nobel prize-winning man Al Gore met with concerned celebrities this morning at Denny’s to discuss the nation’s largest decline of headroom since the 1930’s. Celebrities, Gore says need headroom more than most because their heads are proven to be more inflated than nobodies, or typical consumers. “We have to act now,” Gore said.